Vegan Menu for July 4th! Hooray for July 4th weekend! A long holiday weekend filled with sunshine, friends and feasting is just what I need. And at the center of many July 4th festivities is: food!.. ..Delicious, yummy, beachy, picnic-approved, poolside, summertime food to be exact. There are so many vegan recipes that remind me of this holiday. Red frosty drinks, juicy meatless burgers, summertime salads and cool desserts. 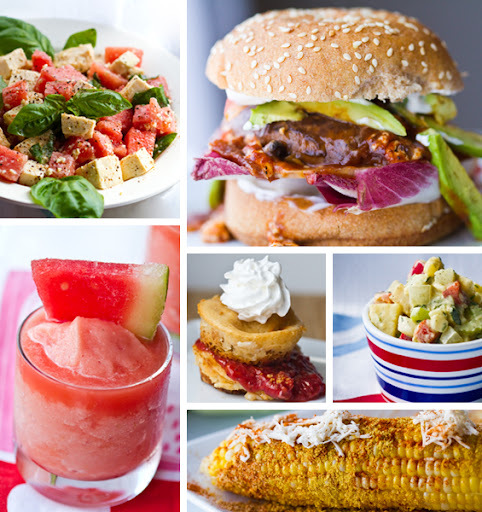 Celebrate Independence Day with a vegan feast! I hope my 4th of July recipe ideas inspire you to add some spunky vegan flare to your holiday weekend. Or go all in for a totally vegan feast. Your vegan spread (think vegan cole slaw, watermelon frosties, Daiya pepperjack portobello burgers & mocha coconut milk ice cream root beer floats) will put those hamburgers to shame. Blended Soy Coffee "Frapp" - better than Starbucks :) .. cuz you make them. Caramel Apple Pie - all American dessert!